Our double leaf swing gates are fabricated from SHS mild steel and have an extremely rigid frame. Infill can be a range of weldmesh systems: ‘V’ mesh, Twinwire or 358 Prison Mesh or alternatively Steel Palisade or Vertical Tubular Infill Bar. For additional security we can add a steel shroud to protect the padlock and a serrated topping which is stitch welded along the top of the gate frames. All double leaf gates come with adjustable hinges, drop bolts and a padlockable slide-bolt. 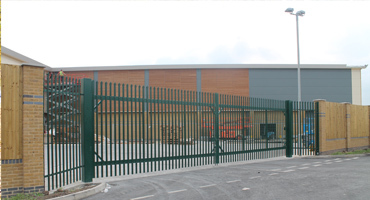 Our Double Leaf Swing Gates are recommended in applications where safety and security are crucial, such as factories, workshops, play and sport grounds, schools, airports and military sites. 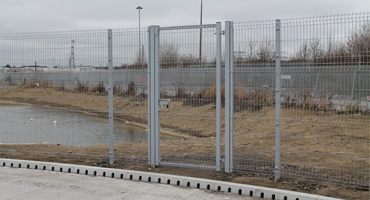 Double leaf gates can be fabricated to suit your bespoke requirements or alternatively we carry in stock a comprehensive range of double leaf gates in various heights and widths typically 1.8m, 2.0m, 2.4m and 3.0m high X 3m, 4m, 5m and 6m widths. Finish: All gates are galvanised to BS EN ISO 1461 then polyester powder coated in a colour to suit your branding. Our double swing gates have an extremely rigid construction and a modern design incorporating adjustable hinges, drop bolts and an integrated padlockable slide-bolt. 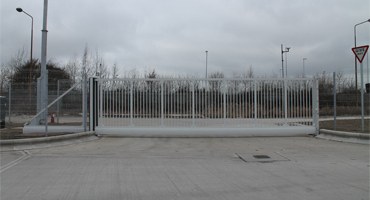 Cantilever manual sliding gate, open in the morning and close at the end of the day! 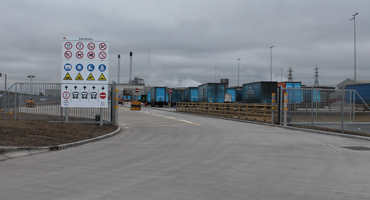 Our Cantilever Sliding gates are fully fabricated off-site to include in-built safety cells, safety pressure strips and drive gear ready to bolt down and commission. Offering CAME gate automation equipment and BPT Access Control, all installed by our own in-house fully trained operatives. Our Pedestrian Swing Gates are all SHS framed and can be clad to suite the fenceline. 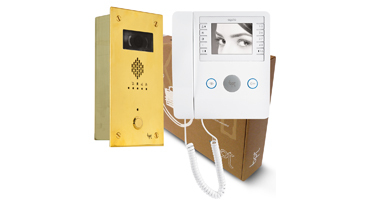 Can come with padlockable slide bolt, locinox key lock or mechanical keypad.